The one drawback about scoring a new job is waiting for the paychecks. While it’s wonderful that I will have money in a few weeks, for the moment it is a little scary. And that’s where my pantry comes in handy! I have this normally bad habit of keeping my “pantry” (it’s actually spread around several kitchen cabinets and my kitchen cart) overstocked–who knows when I’ll need green lentils, red lentils, brown lentils, etc? And it’s true that I have over 50 different spices. And cans of coconut milk and beans. And every weird Korean or Thai condiment you could desire. But this bad habit comes in handy when I don’t have the money to go out and buy anything! This post, short-and-sweet is the first installment of RWF–Recession Worthy Food. It’s how I (and you) can stretch your dollars into tasty, filling, nutritious meals. While I am lucky to have a weird assortment of items already in my home, you can always substitute ingredients, every recipe is essentially a build-your-own. 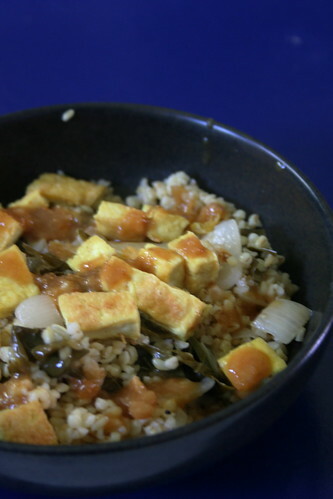 Today’s recipe features Bulgur, rutabaga greens, tofu, and one of Ricki’s amazing sauces. It’s a grain bowl and it’s to die for. Bulgur Wheat typically features in Mid-East cuisine and is extraordinarily nutritious. 100 grams of uncooked Bulgur contains 8 grams of fiber and 12.5 grams of protein. Or rutabaga greens. I’ll admit that I’ve never had them before (not a rutabaga fan), but my Vegetable Husband basket sent them my way and I needed to use them. The instructions said they cook like kale or collards, so all I did was saute them in a little olive oil and water and they turned out great. You can substitute any leafy green vegetable (kale, spinach, collards, etc) for the rutabaga greens. Overall, I loved the bowls. They were filling and delicious and the sauce really goes a long way–I think I got 9 servings out of one recipe! In a skillet, saute the onions and garlic in the oil for about 8 minutes, until the onions are translucent. Add the greens and lemon juice, cover, and cook until the greens have just wilted. Stir in the bulgur and salt. Add the water, cover, and cook on medium-low for 15 minutes, until the bulgur is tender and most of the water has been absorbed. Sprinkle with pepper and lemon juice to taste. In a frying pan, dry-fry the tofu until golden on both sides. Set aside. Whir all ingredients in a blender until perfectly smooth. Drizzle over your bowl as desired. Makes enough for 3-4 bowls (It made 9 for me–this stuff goes a long way!). Put some bulgur & greens in the bowl, and tofu, then drizzle with the sauce! Makes 5-6 bowls. This looks great. It is good to have loads of grains! We’re in serious pantry clean-out mode. So these posts are perfect! Thanks so much. Looking forward to more! Fabulous idea! I’ve been working on cleaning out the pantry for a while and this idea looks so yummy! Sounds good. I love one-bowl meals like this one. I have never heard of rutabega greens until now, but if I ever see them I will be sure to try them! Sounds great! I love bulgur, and I have yet to try rutabega greens – I’ve never heard of them, but I’m always up for greens! This is a great idea, especially since I’m craving a bowl type dinner right now! i love it! definitely recession-worthy. i think i have most of those things in my pantry too. Oooh what a great series idea! I can’t wait to see your recipes, especially with the VegHub produce! i love this, Jes – hooray! i’m all about some recession worthy foodz and a super fun challenge with pantry yummies! we’ve got a lot in our pantry too and it’s nice to use it up and create fun meals that rock & don’t require a lot of cash! superw00t! i too have never had rutabaga greens – totally gotta try ‘em out! bulghur = one of my favorite grains, and you know anything with garlic, olive oil, and lemon is a combination of deliciousness that i’ve gotta make! mmmmmmm! It’s comforting to have a stocked pantry, Jes. Your bulgur bowl looks delicious. The orange fig sauce sounds very exotic. Right on, RWF! hey, congrats on your new job and have fun with your pantry challenge! you’ll make some really creative stuff, i know it you’re already off to a good start! mmm sounds good – i love bulgar. haven’t had any in ages!! I’m always on the lookout for new bulgur recipes- thanks for sharing this one! It looks delicious. Meals in bowls!!!!! My favorite! Ricki’s sauce recipes are so delicious, I can only imagine how wonderful your meal and her sauce complement each other. This recipe will be on my meal list for next week. This looks so good! Definitely more than just recession worthy. And of course I’m a huge fan of meals in bowls ;). Glad you liked the sauce (and wow, did it every last a long time)! Hope you get a paycheck soon! I’m glad you have a pantry to draw from – that’s us, too, in that we tend to stock up against the bad times. Comes in handy!